By Hanna Pamuła - PhD candidate and Bogna Haponiuk. 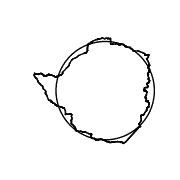 How to find the center of a circle? Weird fun fact: what's the roundest country in the world? How to use this circle calc? 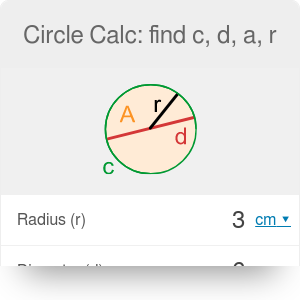 This area of a circle calculator will help you determine the circumference, diameter, area, and radius of any circle. In the article below, you will find all the circle formulas you will ever need to calculate one of these values. Read on if you're looking for the circle definition or want to understand how to find the center of a circle or circumference of a circle - or what pi is. Also, you'll find information below about the unit circle and the properties of a circle, not to mention some fun facts about this shape - if you want to know what's the roundest country in the world, keep scrolling! 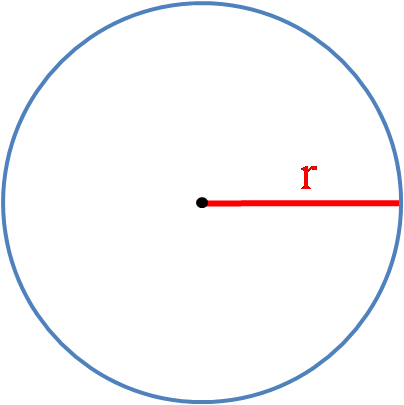 r for radius of the circle. If you already know how to find these values, try the centrifugal force calculator or angular acceleration calculator for how these formulas are applied in physics. For a more practical use, check out our great tree leaves tool or the circle skirt calculator. 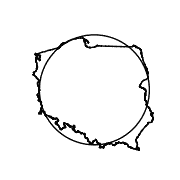 A circle is a planar closed curve made of a set of all the points that are at a given distance from a given point - the center. 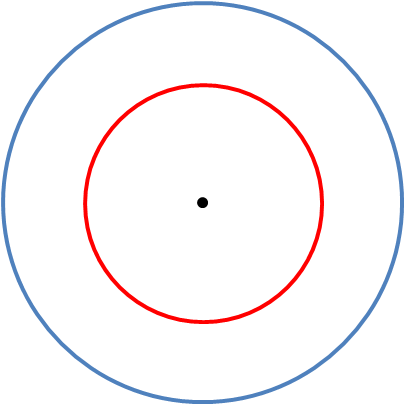 Alternately, you can define the circle as the locus of points at the same distance from a given fixed point. The name circle derives from the Greek, and it means hoop or a ring. 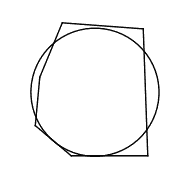 The circle, technically speaking, is only the boundary, not the area inside the shape. The whole figure is called a disc. 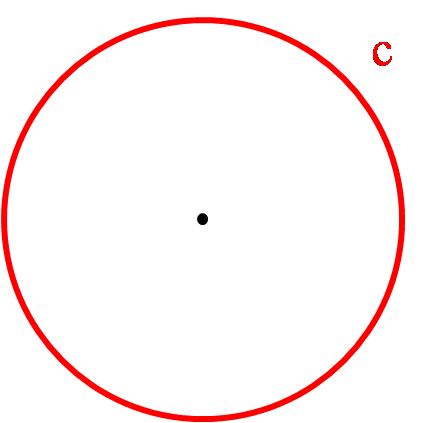 A disc may be closed if it contains the circle that constitutes its boundary, and open if it doesn't. In everyday use the circle is sometimes understood as the disc - the plane surface bounded by such a curve. There are many other terms associated with the circle - such as the arc, secant or tangent - but for our basic explanations, you need to understand only the ones described above. which is highly symmetric - reflection symmetry occurs for every line through the center, rotational symmetry around the center for every angle. that may be constructed through any three points on the plane (not all on the same line). Such circle is a unique circle. 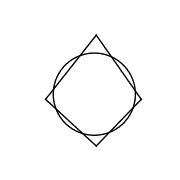 What is more, all circles are similar, and in every triangle, unique circles may be inscribed and circumscribed. A circle has dozens of other interesting properties, which you can discover on your own. There are many other circle formulas that may be derived from the above equations, which you'll find in dedicated paragraphs below. If you're looking for the circle formula itself, check out this equation of a circle calculator. The unit circle is a circle with a radius of one. 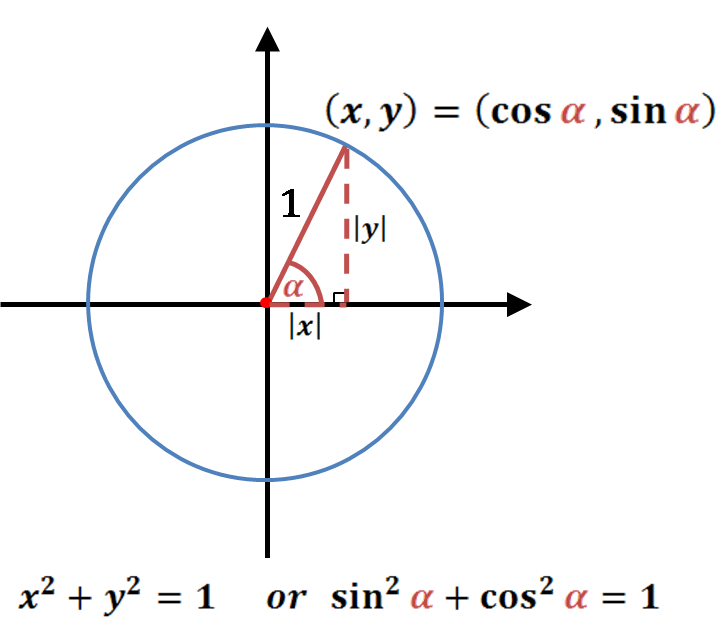 Usually, its center is positioned at the origin (0, 0) in the Cartesian coordinate system. As x² = (−x)², the above equation works for every quadrant, not only the first one. which is an equation known as Pythagorean trigonometric identity. Using a straightedge or a ruler, draw any two chords. 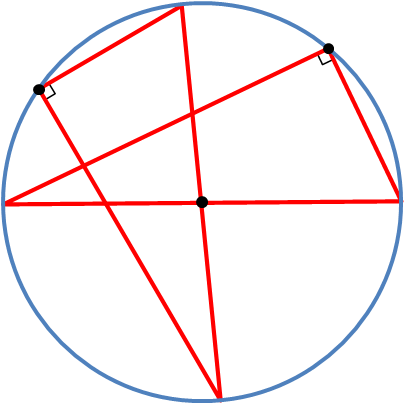 Construct the perpendicular bisectors of one of the chord. 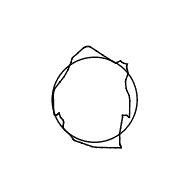 Use a compass to draw two overlapping circles (their centers at the endpoints of the cords, the same radius). 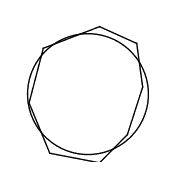 The circles will intersect in two points - draw a line through them using a straightedge. Repeat the construction of the bisector procedure for the second chord. Two bisectors will cross each other in one point, and it's the center of a circle. 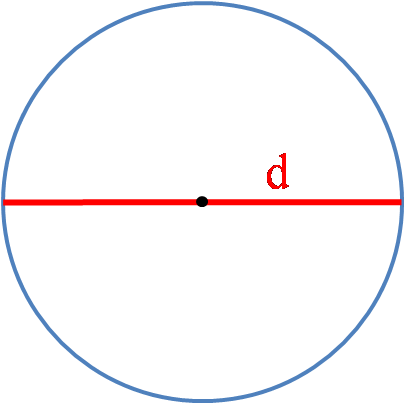 If you want, you can draw the third chord and its bisector to increase - and check - the accuracy of the center of a circle determination. Choose a point on the circle. Take something which has 90-degree angle and straight edges. It may be a triangle measuring tool, but also anything you have at hand - e.g., a book, cardboard, or a sheet of paper. Place the triangle in such a way that the right angle is touching our chosen point. Draw two perpendicular lines across the circle.  Mark the points where they intersect with the circle.  Draw a straight line through the points. 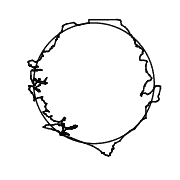 This is the diameter of the circle. simply repeating the procedure - choosing another point on the circle, drawing perpendicular lines and creating another diameter. 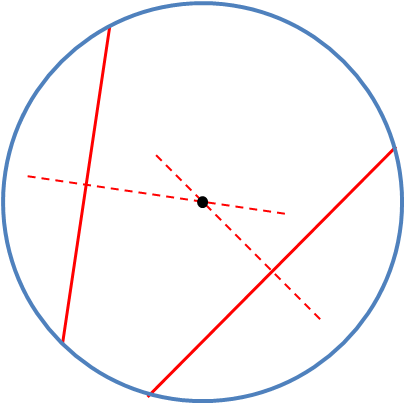 The intersection of two diameters will show us the center of a circle. 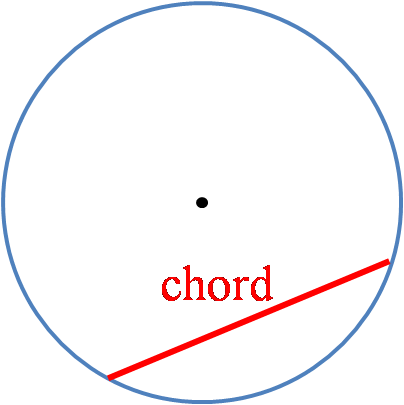 A chord is a line segment joining two points on any curve - this curve may be a circle but also e.g. 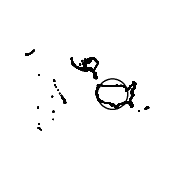 an ellipsis. 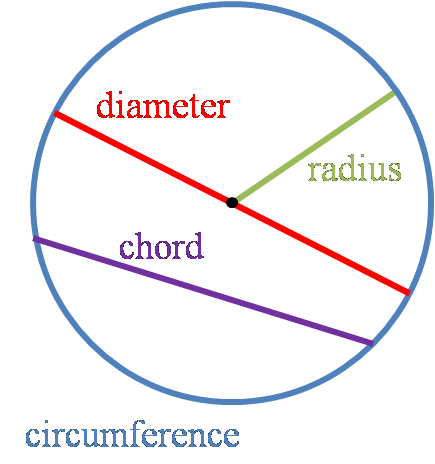 If a chord of a circle passes through the center of a circle, then it's called a diameter and is the longest chord possible. 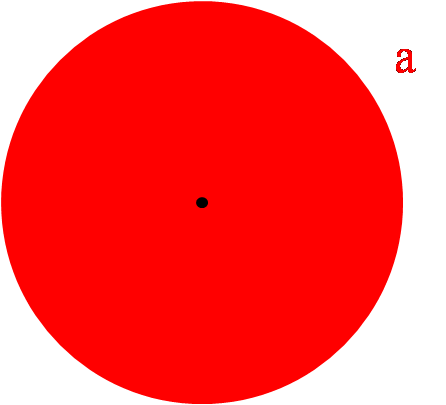 where α is a central angle, taken in the positive sense and must lie in the interval 0 < α ≤ π.
Concentric circles are circles with a common center. 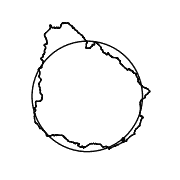 The ring-shaped object - the region bounded by two concentric circles of different radii - is called an annulus. What are real life examples of concentric circles? The π is an irrational digit which means that no finite number of digits can represent π exactly (and they never repeat). Pi has been calculated to over twenty-two trillion digits beyond its decimal point, and this number is still rising with the development of computing technology. There are competitions in which the contestants are trying to memorize as many digits of pi as possible. The world record certified by Guinness World Records is 70,000 digits, whereas the non-official by retired Japanese engineer is above 100,000 digits. There's a style of writing called pilish. The lengths of consecutive words match the digits of the pi, e.g. That's a great method to memorize the pi digits, as the brain is far better at remembering words than it is vast strings of numbers. Maybe you'll exercise your mind and invent your own pilish story? Several books about pi constant have been published. There are of course standard mathematical essays among them, but not only - even full books are written in pilish! The one called "Not A Wake: A Dream Embodying π's Digits Fully for 10000 Decimals" by Mike Keith holds the record of the longest pilish text with 10,000 digits. There's a Pi day celebrated by many π enthusiasts. It's on March 14, as the date suggests (3/14). A few years ago, in 2015, there was a "special" Pi day, as the next two digits appeared in the date (3/14/15). And time - 9:26:53 - added even more digits! How can you celebrate this special geek day? Dress like Albert Einstein (he has birthday on the Pi day) and eat circular treats all day: from obvious pies (πs?) to pancakes to almost-perfectly-round pizzas. Although learning π to hundreds or thousands of digits may be fun (? ), it was determined that only 38 decimal places are enough to measure the circumference of the observable universe. With the accuracy of the width of a hydrogen atom. Check out the video about π and size of the Universe by mathematician James Grime on the Numberphile channel. In common use, squaring the circle is a metaphor of struggling with some difficult or even impossible task. But what does it mean from a mathematical point of view? It's been a problem for mathematicians since antiquity. It's the task of constructing a square equal in area to a circle, but using only a straightedge and compass. The problem was proved impossible to solve in 1882 when mathematician Lindemann showed that π is a transcendental number; thus π and √π cannot be constructed. However, if we remove the constraint of ruler and compass, the problem is easy and was already solved and described many times. You can meet the square and circle word combination in everyday life: boxing and wrestling rings are known as squared circles. The name comes from the traditional shape of a ring. When it comes to a sphere, it's a perfectly round geometrical object in 3D space that is the surface of a completely round ball. It's analogous to the circle and disc - but it's in three, not in two dimensions. 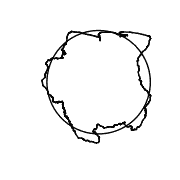 Also, the term a circle of a sphere exists, and it's a circle that lies on a sphere. 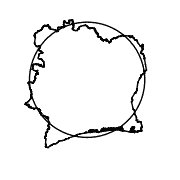 Great circle is the one whose plane passes through the center of the sphere, any other is called a small circle. It's used, e.g. in cartography and geography - equator is the only great circle in parallels of latitude family, but all meridians of longitude, paired with their opposite meridian form great circles. We can compare countries in many ways - by their area, population or GDP, by have you ever wondered what's the roundest country in the world? A mathematician and a blogger Gonzalo Ciruelos calculated the roundness parameter and created the ranking. The winner in roundness category is Sierra Leone, while the title for the least round country in the world goes to the Marshall Islands. Ranking of countries roundness, we present a table adapted from a Mr. Ciruelos' web page. Sierra Leone is a leader, but it's also 14th in another ranking - the world's most rectangular country! To make it even more confusing, the 4th-roundest country - Vatican City - is the world's 2nd most rectangular country, and Poland, 5th in the roundness classification is 10th in the rectangular ranking. How is it even possible, to be rectangular and round at the same time?! It's all about the definition of the rectangularity and roundness which may not be adequate for complex or scattered shapes - and the borders of nations usually are. You can find a better explanation and discussion of the results here. Assume that we want to imagine how big is the exemplary crop circle. We'll choose the one inspired by Euler's identity, found in 2010 at Wilton near Marlborough, UK. Euler's identity is a special case of Euler's formula (which may be derived from the unit circle in the complex plane). Type the given dimension into the circle calc. We know that the crop circle was approximately 300 ft in diameter. If you need to change the units, click on the unit name and choose the one you need from a drop-down list (feet in our case). the area is 70,686 ft² - or 1.6227 ac or almost the area of a soccer field! (to be more exact: ~92% of soccer field area). Experiment with the calculator, try it out yourself. On the topic of circles, why not check what's the circumference of your bike wheel? Hanna Pamuła - PhD candidate and Bogna Haponiuk. Circle Calc: find c, d, a, r can be embedded on your website to enrich the content you wrote and make it easier for your visitors to understand your message.